Please see our Facebook invitation for a current list of vendors. does anyone know where i can get a fake syringe? fake as in "this looks real but isn't" or "there is no way anyone would think this is an actual syringe". i'm going to a halloween party dressed as a serial killer (because they look like everyone else :D ) and kind of want to bring a tool of the trade. i'd probably fill it with water tinted blue or something. 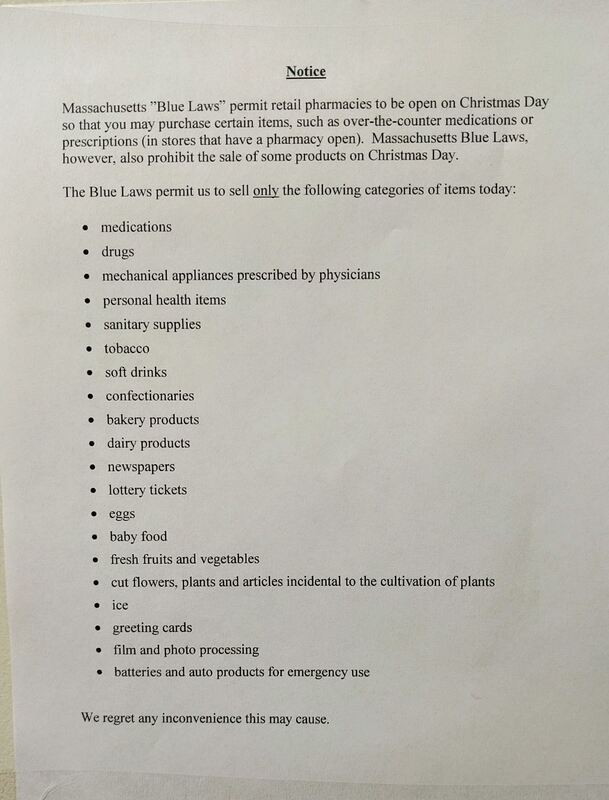 The Davis Square CVS had these signs up inside and outside the store yesterday, limiting what you were supposed to buy there on Christmas Day I didn't try to buy anything, so I have no idea whether this was actually enforced in any way. The self-checkout terminals were still working. Neither of the other two CVS stores I visited yesterday, at South Station and Harvard Square, had these signs. Back in 2014, the store had a similar sign up for Thanksgiving, but I didn't get a photo then. Healthy Tomorrow will hold a rug and tree sale December 9, 10-4, at Unity Somerville, 6 William St, Somerville, off College Ave near Davis Sq. Rugs are fairly traded tribal and traditional rugs from Afghanistan, Pakistan, India and Iran and trees are Balsam firs from Nova Scotia. All proceeds go toward our work in Mali, trying to stop female genital mutilation. For more info see StopExcision.net or call Susan McLucas at 617-776-6524. Everyone's welcome to come and enjoy Havurat Shalom's sukkah as we have several services and meals coming up! Sukkot services Wednesday 10/4 at 6:30 pm, followed by a vegetarian potluck in the sukkah, and Thursday 10/5 at 10:00 am, also followed by a vegetarian potluck in the sukkah. Shabbat services Friday 10/6 at 6:30 pm, followed by a vegetarian potluck in the sukkah, and Saturday 10/7 at 10:00 am, also followed by a vegetarian potluck in the sukkah. The 1st floor of Havurat Shalom is wheelchair accessible, including the prayer room, dining room, living room, and bathroom. For the health of those with allergies and chemical sensitivities, we request that you not wear perfume, aftershave, or cologne to Havurat Shalom. The bathrooms are all-gender. The High Holidays at Havurat Shalom are a wonderful, intense, prayerful experience. They are also free! We do not have tickets. Everyone is welcome! We hope you'll join us. Contact us for disability access info or requests. Childcare is available on a first come, first served basis for all of Rosh Hashanah, except the second night, and all of Yom Kippur, except the afternoon break. My daughter would like to view the Boston fireworks, but not from up close (i.e., dealing with crowds). Suggestions on where in Somerville we could go for a decent view of the Boston sky tomorrow night? ...right in front of my apartment at the dead end of Highland Road. 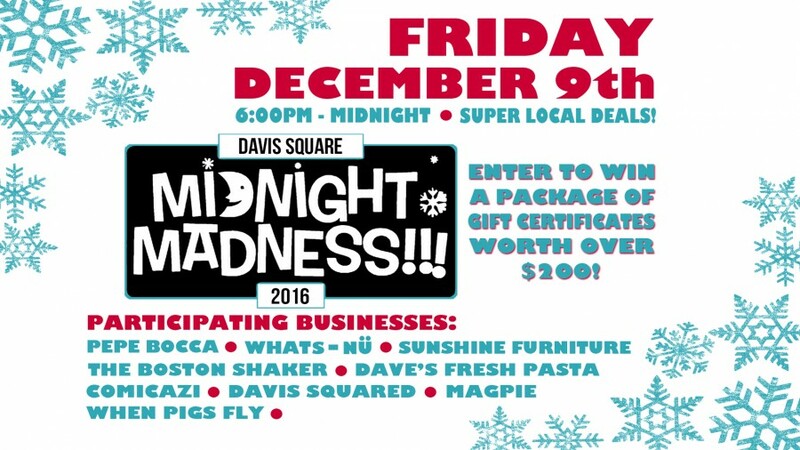 Bundle up the kids, grab your menorah and join us for a night of light and fun! Together we will enjoy latkes, dreidls, singing, and a casual music jam. We will be making havdallah and lighting candles together at 6:45 pm. You are invited to bring your musical instruments as well as your chanukiah (menorah) or share in lighting one of ours. Contributions towards a potluck dinner are welcome. My SO and I finally managed to get tickets to the Illuminations tour-- in past years we either missed the date they went on sale, or just couldn't make the tour date(s). I am a hobby photographer and would love to try out some night shots on the tour, but can't find two pieces of information to help guide me in what lens(es) to bring and whether it'll be possible. Hope you guys can help! 1) Are the trolleys the kind that are basically outdoor seating, where everyone kind of sits facing outward (aka like one of the old SF cable cars)? Or are they the kinds that are really just buses with trolley-like exteriors and everyone is inside behind glass? 2) Do the trolleys tend to stop, or at least realllly slow down, at the houses? Or do they more or less just cruise by at a decent clip? Tisha b’Av commemorates the destruction of the first and second Temples. In keeping with the theme of mourning losses the Jewish people have suffered, at the Havurah we read by candlelight or flashlight, don't greet each other before or after the service, and those who are able to sit on the floor. In addition to chanting Eicha (Lamentations) we sing mournful songs. Although sad, it can be a powerful experience and we hope you'll join us.